Love this photo of a treehouse in Daniel Augschöll's portfolio. I was just having the thought that treehouses are one of the things sorely lacking in the lives of urban kids. 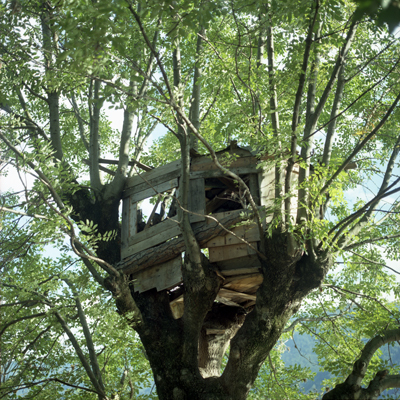 I wonder how far a guerilla urban treehouse initiative would go before it got shut down. Upon searching for our first home to buy, I told my fiance that I would only considered buying a house given it had a great tree-house/tree-climbing tree somewhere on the property. We probably won't have kids for another five years at least and who knows if we will still live there when we do. Better safe than sorry.